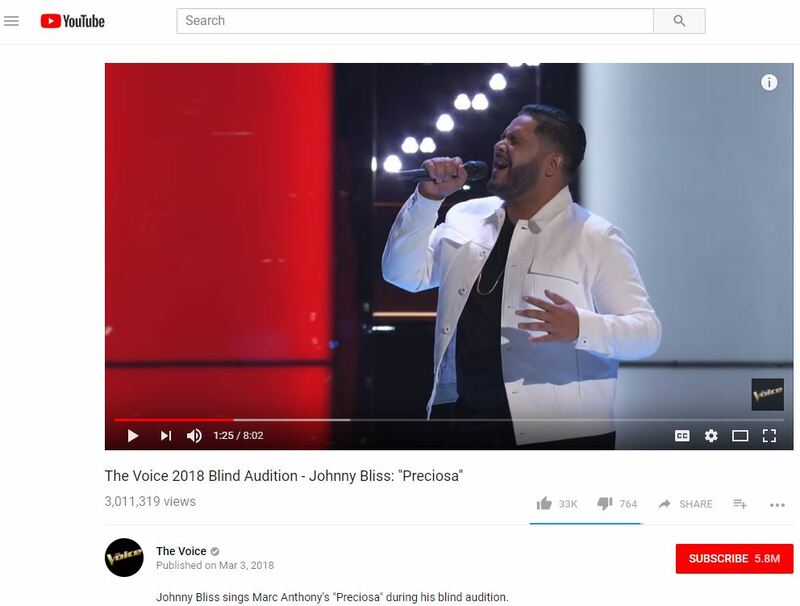 When Johnny Bliss auditioned on NBC’s The Voice, he sang “Preciosa” by Marc Anthony. Johnny Bliss scored a four-chair turn, as the coaches turned their chairs during this emotional performance. After the performance, all four coaches agreed that Bliss is a special artist with a unique voice. All four coaches wanted Bliss to join their team. Adam Levine commented that he likes Bliss’ artist name. Levine also blocked Kelly Clarkson in hopes of getting Bliss to join his team. Blake Shelton used Adam Levine’s block against him to try to get Bliss to join his team. Shelton said that Levine took the opportunity of working with Clarkson away by blocking her. At 5:28, Johnny Bliss told The Voice coaches that he sang onstage for Puerto Rico. He dedicated this song and performance to Puerto Rico. He believes that Puerto Rico will rise again. “Puerto Rico se levantará de nuevo,” Bliss said. Alicia Keys sang “If I Ain’t Got You” in Spanish after expressing that she could relate to Johnny Bliss. Alicia said she was named after her Puerto Rican godmother and shared her story. Kelly Clarkson loved Alicia Keys’ performance and felt Bliss would pick Keys to coach him. In the end, Johnny Bliss chose TEAM ALICIA. On March 19, The Voice‘s battle rounds premiered live. Julia Michaels (Team Adam), Shawn Mendes (Team Alicia), Hailee Steinfeld (Team Kelly), and Trace Adkins (Team Blake) will mentor the singers as guest advisors during the battle rounds. Johnny Bliss is on social media at @thejohnnybliss on Twitter.